Day three started with breakfast at a great local restaurant in east Austin called “Cisco’s”. While we were having breakfast one of the bands that we saw perform on Friday came in for breakfast too. The band was called “Wild Beast”. They were very nice. We just told them how much we enjoyed there show and then left them alone. I’m sure they enjoyed their authentic Tex-Mex breakfast as much as we did. We got to the concert a little earlier than I thought we would and caught about half the set of another English group called Graffiti 6. We had not planed to see this group but they were very good. They sounded kind of Jamiroquai like. The vocals had a soul edged rock sound to them. They are about to release their first American single. They played the song and I liked it. It sounded kind of like The Spencer Davis Group. Back at the main stage we saw a band with the very interesting name of Airborne Toxic Event. They sounded like a cross between The Clash and Bright Eyes. The lead singer looked like a tatted up hood but when he spoke to the crowd he was a very kind and thoughtful person. He dedicated a cover of a song by The Magnetic Fields to his recently deceased Grandparents. He dedicated another song to our soldiers in Afghanistan and Iraq. He also did a very cool cover of the Bruce Springsteen song “Fire”. Immediately after I made a comment to my friend that they sounded kind of like The Clash they covered “Rockin’ The Kazbar”. They closed their show with a rousing version of “I Fought the Law and the Law Won”. 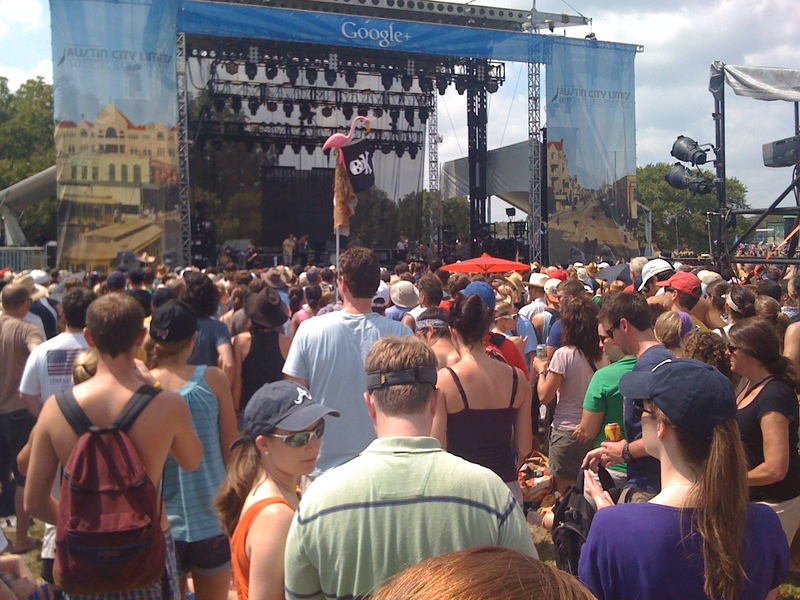 This band had played ACL before and a large and enthusiastic crowd tuned up to see them. During the intermission I went to get some food and beer. Every day I at these Grilled Steak Kebabs from Tim Love’s Lonesome Dove Cafe. 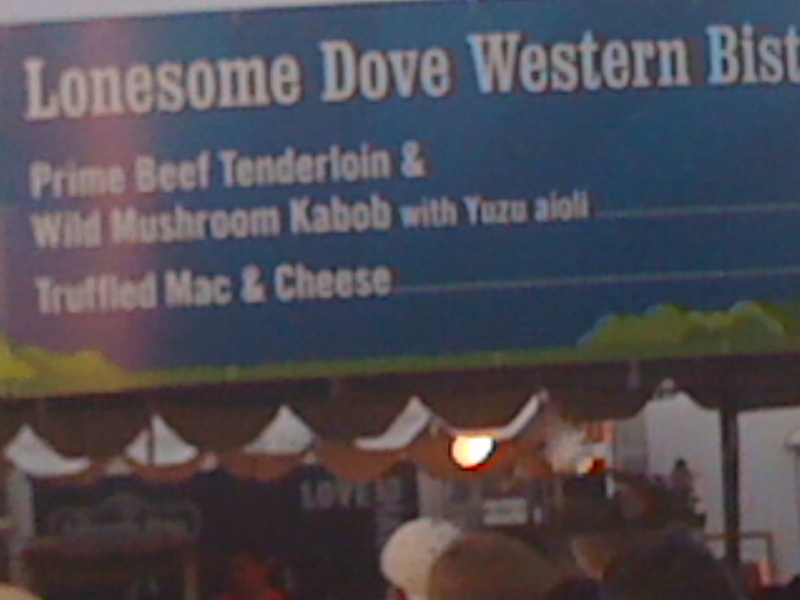 The food at ACL is very, very good. Especially Tim Love’s food. Here’s a picture of his sign above their booth. The next band I saw was Broken Social Scene. This band hails from Canada. They are great practitioners of Phil Spectors “Wall of Sound”. There were at least 9 people in the band. There music soars. They use a lot of distortion. They were not afraid to make a lot of noise. Neil Young would have loved their set. Late in their set they did a very cool cover of a Modest Mouse song. I would highly recommend this group. The sun was beginning to set when Fleet Foxes took the stage. I have heard of this band for some time and I was very interested in seeing them live. This set was one of the highlights of the entire 3 day event. This is a very serious band with highly sophisticated music and harmony. They had as good of harmonies as Crosby, Stills, Nash & Young or The Eagles. They were every bit as good of musicians too. What an amazing band! I loved them. So that brings me to the end of the show. The last band standing. Sunday night September 18, 2011 Arcade Fire burned the house down! They put on a fantastic show. They light show was blinding at times. They are also great practitioners of “The Wall of Sound” . They remind me of Talking Heads at the end of their career when they did Stop Making Sense. The lead singer sounds and even has some of the mannerisms of David Bryne. The woman in Arcade fire that plays all of the different instruments and sings lead vocal on certain songs, kind of stole the show. She also got to sing lead on the very last song. The whole crowd dispersed singing her catchy song.